For Steve's 30th birthday we had grand plans to visit Las Vegas. I researched, researched and researched and had our full itinerary worked out. You know me, I had already picked the best restaurants and decided which shows we were going to book. One performance we did not want to miss was Cirque du Soleil (showing at the Bellagio at the time - I'm not sure if this is still the case). Cirque du Soleil didn't tour in those days and I read rave review after rave review and watching the show was pretty much a bucket list thing for me to do. Life got in the way though and I fell pregnant with Jack so our epic Vegas trip was put on hold - we will visit one day, I'm just not sure when now. 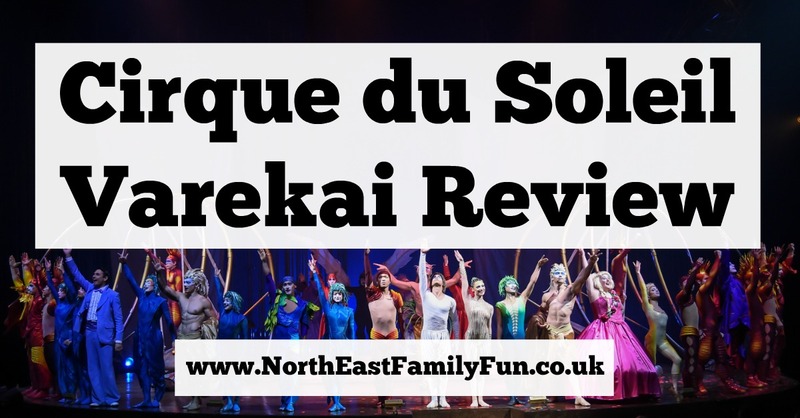 Then Cirque du Soleil started touring the world and various shows have visited Newcastle in the past. Money has generally been tight over the last few years as I have transitioned to working self-employed and I will be honest when I say the price tag of £50+ per ticket has put me off. I know this is weird but I wouldn't mind paying this on holiday as it would all be part of the 'holiday fund' but for Steve and I to buy tickets to the show, it would cost £100+ and then there's taxis, drinks ect.... to consider too so probably around £150 in total. This is not the sort of cash I would readily spend on a normal Wednesday night out in Newcastle. Cirque du Soleil was still on my bucket list though and I was in quite the quandary - was it worth spending all that money on? Then as if by magic, I was offered press tickets to review Varekai at Newcastle's Metro Radio Arena on opening night. I can't tell you how excited I was and immediately made plans for a much-needed girl's night out with my good friend Karen. I have tried to remain fair and balanced in this review but obviously, my excitement at watching something that has been on my bucket list for so long will probably show through too! 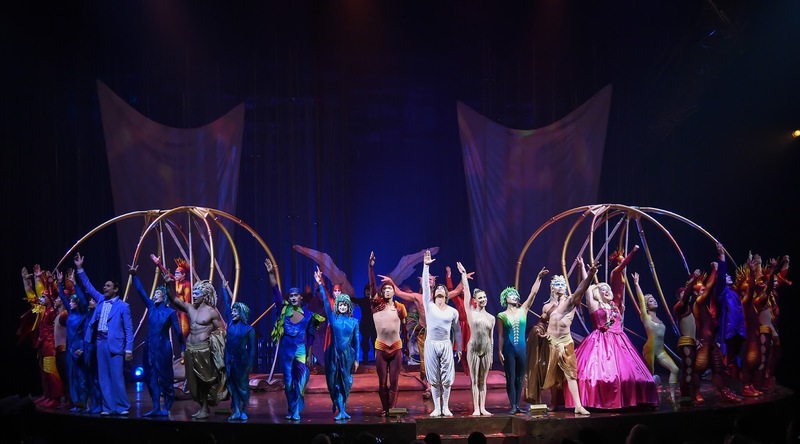 Varekai is a critically-acclaimed production that has already wowed 10 million people worldwide since it's debut in 2002. 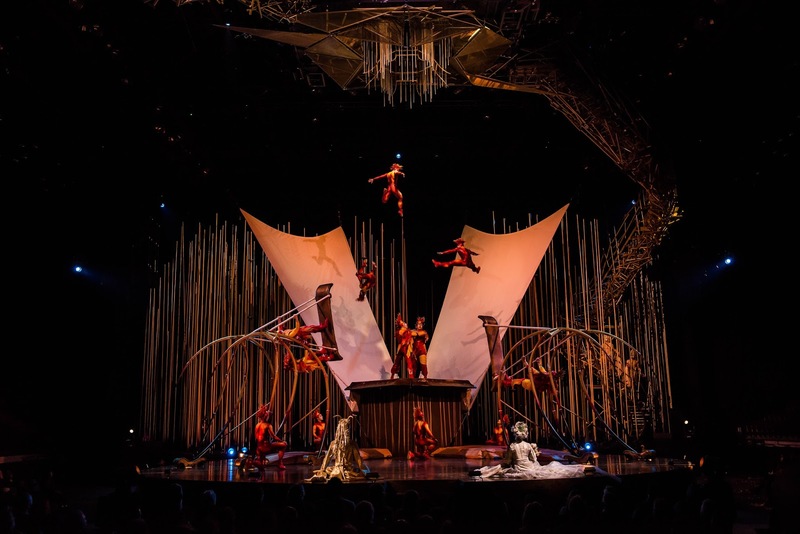 Set deep within a forest at the summit of a volcano, Varekai tells the story of an extraordinary world where anything is possible. 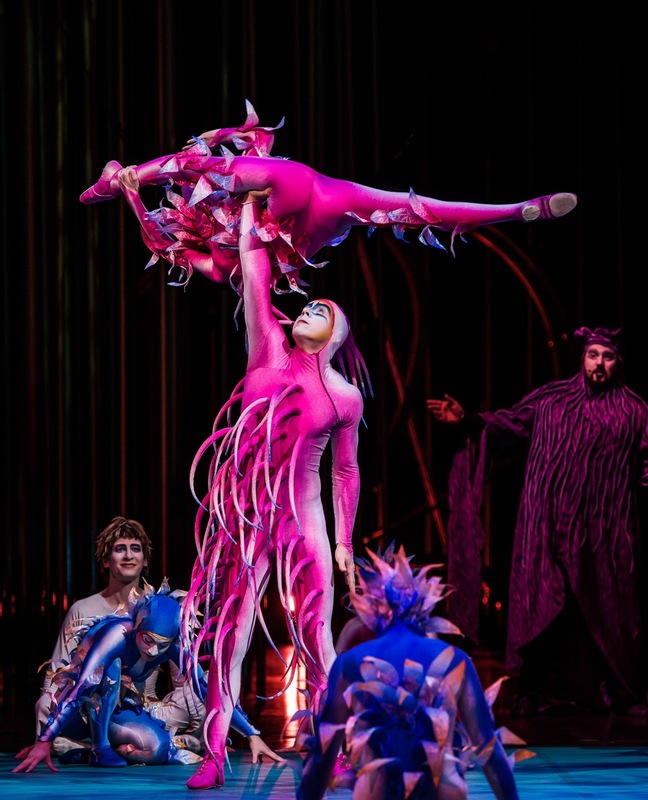 Varekai features over 50 performers and musicians and it's no exaggeration when I say it is a real feast for all of your senses - sometimes you just don't know where to look! Expect everything from death-defying aerial flights to entertaining clown performances, impressive hand balancing to synchronised tumbling and trapeze and Russian swings. When Varekai was good, it was spectacularly good. Think of the best act you've seen at a circus and then multiply it by 100. It actually takes your breath away at times. The cast's experience really shines throughout and not a single foot or step is put wrong (or if it is they are so good at hiding it that you don't notice it). We were wowed by the strength and teamwork displayed in the aerial straps, tilted our head in amazement at the hand balancing act and how much the performer could twist her body whilst remaining perfectly balanced and the performance with the juggling sticks was so fast and slick it was almost as if our eyes couldn't keep up - absolute world class stuff. The highlight for us though was definitely the Russian swings and we were on the edge of our seats as acrobat after acrobat flew through the air at great height and speed. Another part of the performance that I very much enjoyed was the staging. There is a live band which really adds to the Varekai experience and the stage feels as if it has several layers to it. It's almost as if it's a continuously moving set. Expect a plug to appear and water to drain away in front of your eyes, performers to pop up just about anywhere, the stage to turn into a giant trampoline at one point and there will always be something happening in the deepest part of the forest right at the back amongst the trees to catch your eye. Varekai is brought to the audience too with the whole arena being used whether this be drummers marching through the audience, clowns playing jokes on the first few rows or comedy singers running right through the crowd to the cheap seats at the back. I have never seen the whole arena being used like this but it's fantastic and feels like a much more inclusive performance. As much as I wanted to, I didn't love every single act and I just wasn't a fan of the clown acts. It felt bizarre watching a beautifully choreographed acrobatic and dance routine one moment and then the next watching a silly magic show. It just didn't flow right and it felt like I was watching two different shows at times - the wonderful routines and then a bit of slapstick. It didn't make sense to me. It may just have been that the clown's humour wasn't my cup of tea - there were plenty of laughs in the audience, they just weren't from me. I know my kids would have been crying with laughter at the foolish clown double act had they been there but the clown's performance felt a bit too much like the sort of comedy routines you'd expect to see on a holiday park in Spain and not a world class show to me. I did kind of think towards the end of the show that maybe the performances contrast so much as it helps you to appreciate the beautiful parts of Varekai even more? Let me know what you think if you've seen it. Varekai ended with a part-standing ovation in Newcastle and I have to say, I was impressed with my first Cirque experience and it didn't let me down. The 2 hour+ performance flew by and I could have easily sat and watched another hour or so - it was mesmerising. I would pay to see another Cirque du Soleil show after witnessing what they're actually like and definitely think it is worth the £50ish price tag. I think my next trip will be for another girl's night out though so I only need to pay for my own ticket rather than a family night out where it would cost me £250+. This amount of cash on a week night out for the family will always feel very expensive for me. That being said, if you have the money to buy your family tickets, I think children from around aged 7+ would really enjoy the performance too and will probably leave feeling inspired. Let me know if you've watched a Cirque du Soleil performance and if you have tickets to watch Varekai this week. So excited to see this tonight, it sounds amazing! Who need Vegas anyway when you live in the Toon? Have fun Rachel - Varekai won't disappoint! It looks awesome. I bet it's really impressive to watch live. It really was - I am so thankful for the opportunity. It was so good. We loved the clowns though. We were chuckling along! It gave a different perspective and as you say made the acrobatics even more spectacular! Glad you had fun. I've never fancied a cirque du soleil show (and I hate clowns!) and that price tag would definitely put me off. Great review I really enjoyed reading it. I do like a good circus act. I particularly understand your sentiments in regards of price. It does look like a spectacular show. Thanks Sarah, it certainly was spectacular! I hear you with regards to the clowns. The acrobats look fantastically impressive though!